I made my boys airplane pilots. I started with diaper boxes for the body and then I cut out the wings and the tails from cardboard as well. I spray painted the airplanes and used black tape for the detail work. 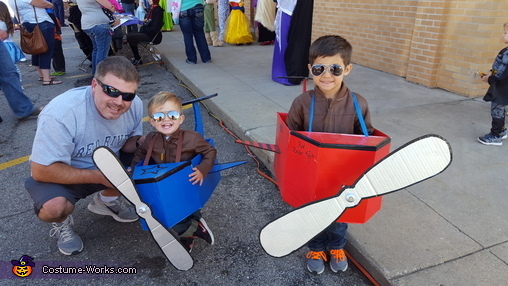 The propellers work and are controlled but a steering wheel the boys could operate. I dressed them in bomber jackets and pilot shades. These were a hit!